Royal Icing is a traditional icing for covering celebration cakes as it creates the more classical, formal style for wedding, christening and Christmas cakes. Royal icing has to be built up in several coats and allowed to dry in between each application. A drier consistency is better for flat icing, while a softer consistency is used for peaked icing or piping designs. Royal icing can be made using either fresh free range egg whites, dried albumen or meringue powder, icing sugar is added to achieve the desired consistency. Some recipes will call for glycerin to be added when frosting cakes with Royal Icing. If leaving prepared icing for any length of time cover the surface with cling film or damp cloths in a grease proof container to prevent it from drying and forming a skin. The “NEW” A Royal Mix works for all applications regular royal icing would be used and much more stable than any other royal icing recipe. The new royal icing works much easier and you can hold in your hand longer than any other Royal Icing. You will never go back to regular fresh egg whites or Meringue Powder again. 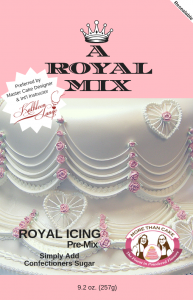 Order “A Royal Mix” Today from Confectionary Chalet or More Than Cake.